The newest pizzeria in town has super cute interiors and it's perfect for spending hours with your squad. 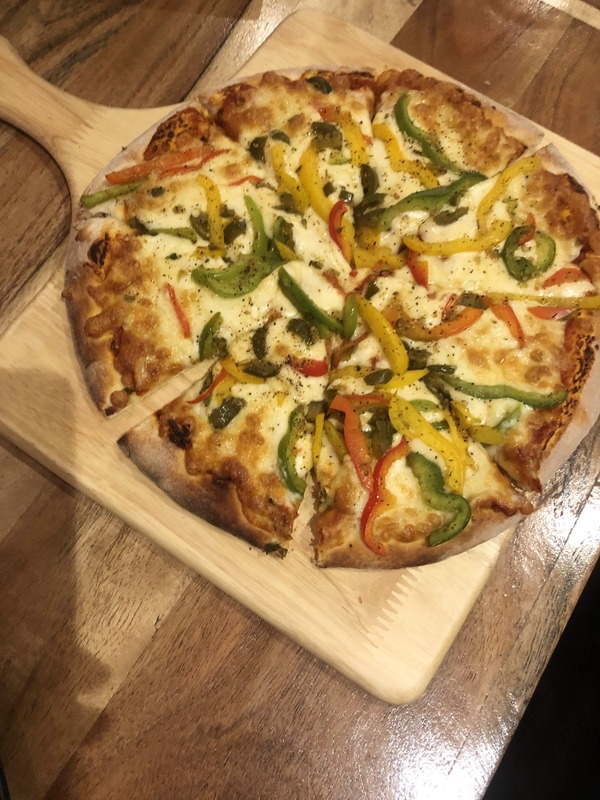 Brickwood Pizza, in Madhapur, is a two-storey pizza parlour that is barely two-weeks old and serving delicious wood-fired pizzas. We really loved the colourful posters, brick walls, thread art (reading pizza), edgy lights and the cozy cartwheel seating that makes this place amazing to chill at. The menu here has savoury dishes from which we picked Garlic Chicken and Loaded Pulled Cheesy Garlic Bread. The Garlic Chicken had chewy pieces of well-cooked chicken, but it was a little too salty. The Garlic bread was devoured within minutes for its crispy edges, and soft bread full of veggies that dominated the taste of garlic. We went for a Smoky Pepper Pizza (although they have pastas and steaks too) which took quite some time to be served and had a fluffy crust. So full of toppings, we had a wholesome meal of the Jalapeños and Bell Pepper pizza. However, we wish the smokey flavour was a little more distinguished. While we waited for our food, we were thrilled to find board games and card games like UNO, Monopoly Deal, Jenga and more that kept us entertained. The staff was lovely, and we'll be back to try their Freak shakes (Tiramisu, Lava Burst) and coolers soon. Within the premises is also a waffle outlet called Wafflin' Around which makes mouth-watering red velvet waffles, if you're in the mood. We'd love it even more if they sped up the service a little bit.